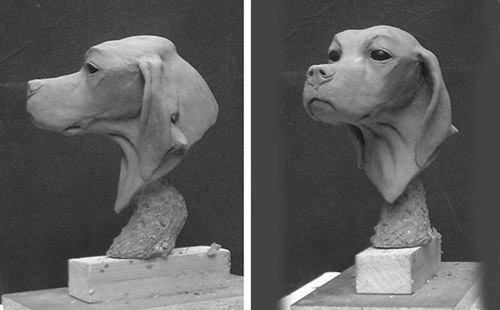 Recently, a friend asked me to produce a sculpture of his wife's dog Penny, a pedigree "Pointer". 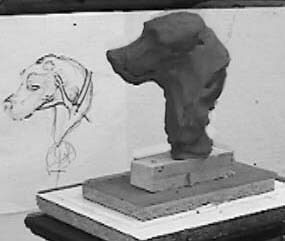 Penny is a pretty dog and we agreed that this would be non-exclusive commission whereby the sculpture would be of this particular dog and he would have the first casting but I would have the right to sell this as a part of the range of products in my Sales Gallery. This is brief picture diary of the course of this commission from concept to casting and hand painting the final product. This piece was intended as a resin casting for hand painting from the outset. 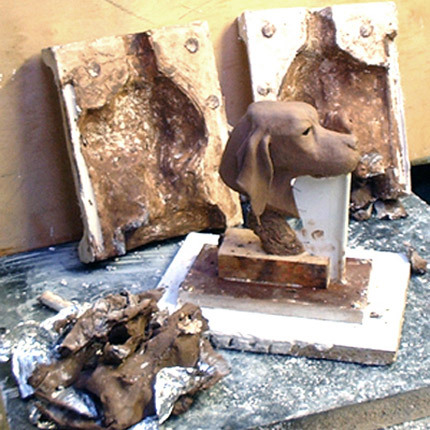 It is important to decide this early on what the final medium will be as there are a number of differences both in sculpting techniques and in mould making if you intend to produce a hot or cold cast bronze as opposed to hand painted resin. The first thing to do is to take as many pictures of the subject as possible. If you cannot take them yourself you need to rely on your client but be specific about the angles and shots you need. I like to use a camcorder for this as it gives you a good feel for the character of your subject, which if you are lucky will get built into your work. Next take as many dimensions as possible but definitely eye centre's, length of head, nose to 'stop', head width and so on. In this case I decided that the sculpture would be to a scale of half-life size. I used Photoshop to scale up a few of the most relevant photo's to working size, I can then use the measuring tool in photoshop for detailed dimensioning around eyes and ears etcetera. 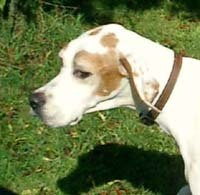 Now it is starting to take shape but the ears are still a little bit incredible. I decided to use marbles or ball bearings for the eyes in the original. 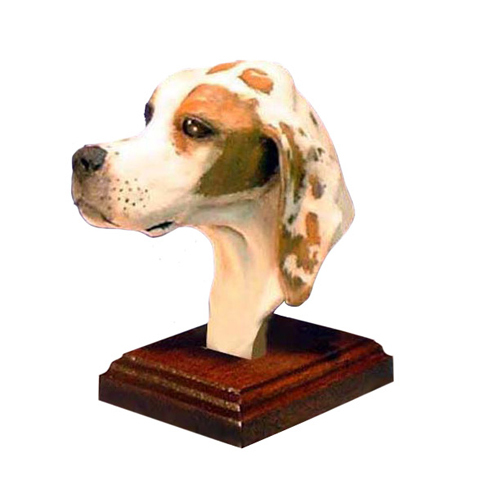 If the piece is to be hand painted, they make for realistic reproduction. 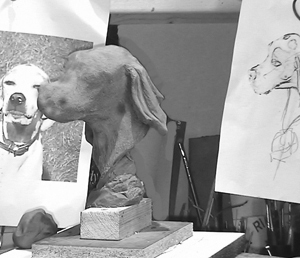 It is very important to get them at the right height, depth and centre's otherwise you can end up with a figure that has eyes pointing in different directions, up down or sideways and it is nearly impossible to correct on the finished casting, even with painting. I decided to make the short stand from neck to base, look like a piece of driftwood, it seemed like a good idea at the time and I couldn't think what else to do. It seemed to work but this was destined to be changed on the final piece. If this was a bronze, I would need to do a two piece mould so that a hollow wax could be painted into each side for lost wax casting. However as this is for a resin reproduction, the more joints or seams I have the more of a nuisance and a disfigurement it will be so I am going for a single skin silicon mould with minimal cut lines - in this case, just one from base to under the chin. I will make the final cut in the mould with a scalpel. Oops! I nearly forgot the registration points for the mother-mould. As you can see, I've incorporated a seam divider under the chin in order to give me a guide when cutting mould at the end. 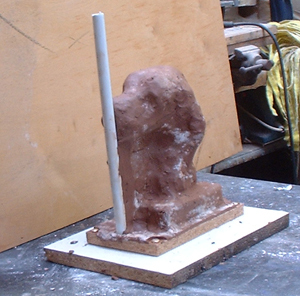 The rod coming down from the chin will also act as an air release in the mould to avoid air bubbles becoming trapped. 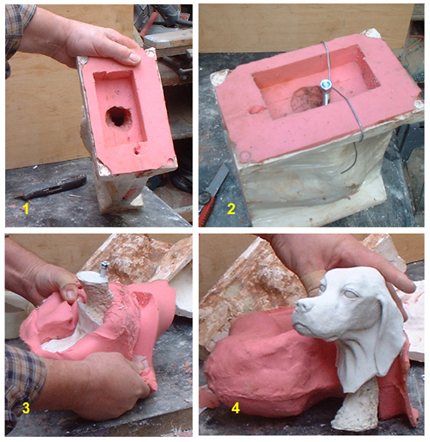 WARNING: If your model is made with a soft clay or is very intricate you need to make a "block mould" or on larger sculptures apply the silicon in layers before going to the next stage. If you do not you could damage your original beyond reasonable repair. 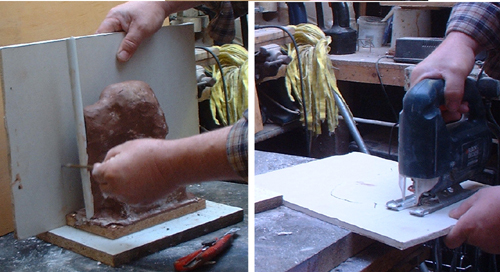 A block mould would be the same process up to now except at this point you would build a containment around your clay original and simply fill it full of vacuumed silicon rubber. You will get a perfect reproduction of your original but made with a lot of expensive silicon. You will then need to use a hard copy reproduction to go on to the next stage. Of course if you only want one copy for yourself you can stop there. As I am making a "skin mould", next I need to protect the my original clay sculpture, I use kitchen foil but you could use cling-film just as well. 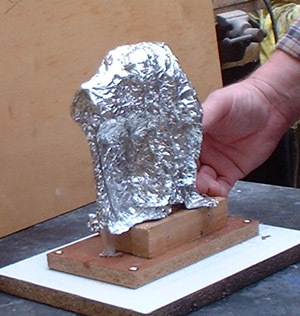 I like foil because there will be some heat generated in forming the mother-mould and I think the foil helps to reduce the effect on the surface. 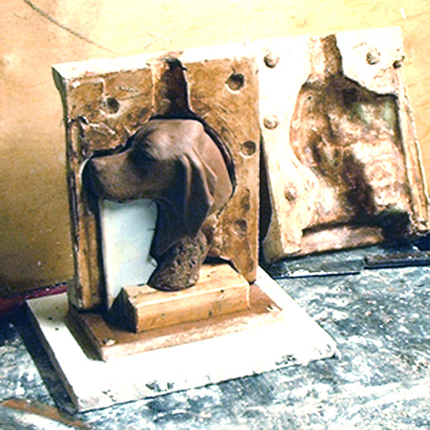 I am now going to encase my protected original, in a skin of wet clay in order to form the mother-mould. I use wet clay because it is soft and forms over the original without the need to exert any risky pressure which might cause damage or movement. The pipe was intend as the main feed for pouring the silicon but in the event, I used a different feed. However it was not wasted as it formed a reference for the silicon and a riser for any trapped air. 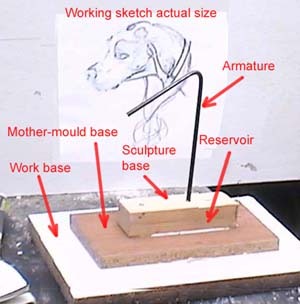 There are many ways to form the boxing for the mother-mould and there are also a few alternative materials to use for the purpose. This is just the way I did it for this figure. In order to form two halves, I often use, as in this case, plaster board. It is strong and easy to cut with a jig-saw. Firstly mark out your work as accurately as you can and then cut it out. This is a little bit simplified but now the plaster board needs to be fitted around the encased original and box shuttering put in place to form the plaster.At this stage, you have to hope your armature was strong enough for it not to collapse, I usually support it underneath to help avoid that situation. 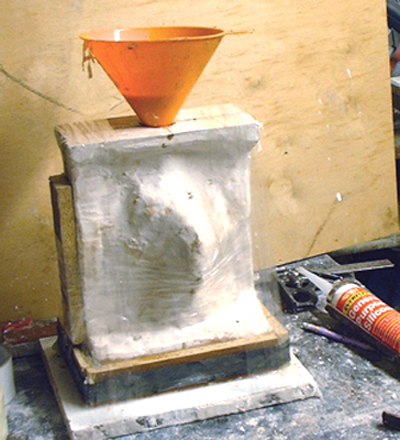 Any gaps around your work piece need to be filled bearing in mind that you need to avoid undercuts or any awkward shapes that might make casting difficult. Also because I've used clay and it will stick to the plaster former I give it a liberal coating of release agent made up of petroleum jelly and white spirit. When I get around to taking the plaster back-up's off later I don't want anything to catch and risk damaging the original. This is essentially a repeat of side one. I need to make registration keys in the plaster so that the two halves join correctly and I use a countersink drill bit for this (pic.2) I also need to use the release agent again on this side to stop the plaster sticking together. 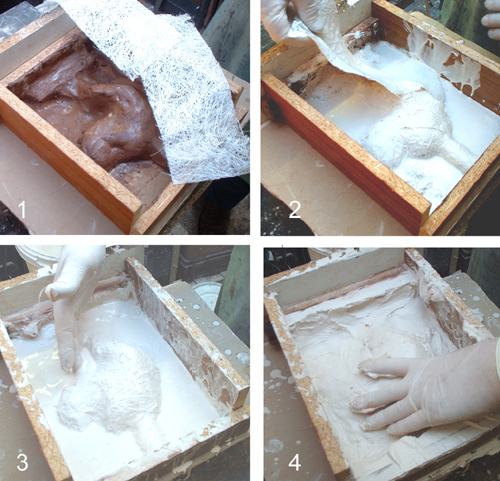 Before discarding the waste clay, I weigh it to give me a rough idea of how much silicon I need to mix for the mould. The inside surfaces of the plaster will need to be cleaned and sealed before the final stage. Also air bubbles need to be filled, I use epoxy putty for this. I would normally spray paint the inside of the plaster cast with grey primer to complete the sealing process and neaten up the mould but I haven't got the time on this occasion. Before moving on, drill the casings wherever it looks like you might have an air trap or want to provide an escape route for air. To avoid the silicon sticking to the plaster surface when it is moulded, I need to use release agent but I believe that the silicon is affected by white spirit so I use a mix of tap water and washing up liquid which works quite well. You must be very careful when placing the plaster back-ups around your original because any little dink or scrape will be forever impressed upon your casting. It is essential that the silicon is de-gassed in a vacuum tank so that all air is removed before it is poured into the back-up plaster. Vacuum tanks are expensive items but the cost can be reduced by buying second hand pumps and making the actual tank yourself but that's another subject. Tip: If you do not have access to a vacuum tank but would still like to use this method, try making a large flat pouring surface out of an old tin tray by cutting the corner off (similar to that thing that the pharmacists use to dispense tablets into a bottle). After you have thoroughly mixed the silicon and catalyst together, slowly pour the mix into a second container via your tin tray held at the angle. As the film of rubber makes its way over the flat surface it should release much of its trapped air. You can help this along by blowing through a straw at any bubbles you see. Turn turn the mould inside out and paint gel coat of resin into all of the nooks and crannies being careful not to leave any air bubbles. 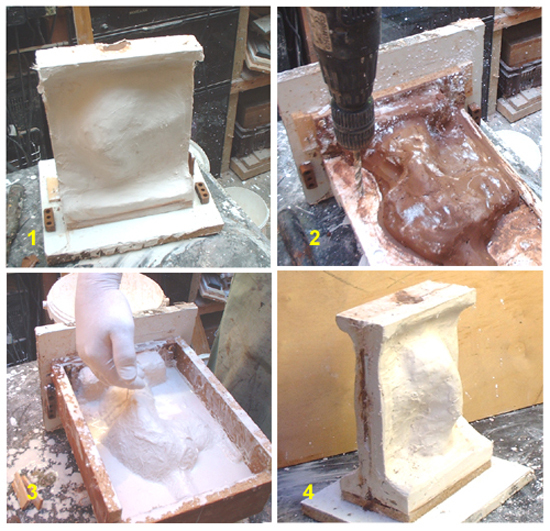 You can then close the mould up and complete the pouring. In 'pic.1' on the left, you can see the reservoir area to avoid expanding resin overflowing in the tank. In 'pic.2' I have inserted a threaded rod mainly as reinforcement to stop the casting from snapping at the weak points and also for fixing it down onto the intended hardwood base. 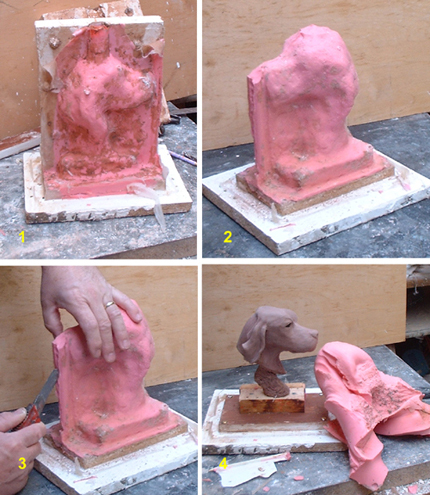 In 'Pic.3' I'm peeling off the silicon and HERE IT IS in 'pic.4' my first casting as good as I could have wished for.